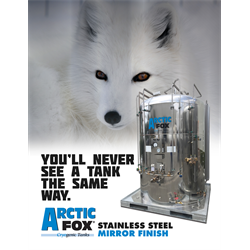 The Arctic Fox® Tank is functionally and aesthetically designed and suited to serve virtually any cryogenic application, from Semi-conductor fabrication to Metal fabrication. The Arctic Fox® Micro Bulk and Mini Bulk Tank has many advanced features designed in a compact attractive package. • Tanks are Built to Specification and come with National Board “NB” Stamp. Call 1-800-264-7793 for more information!